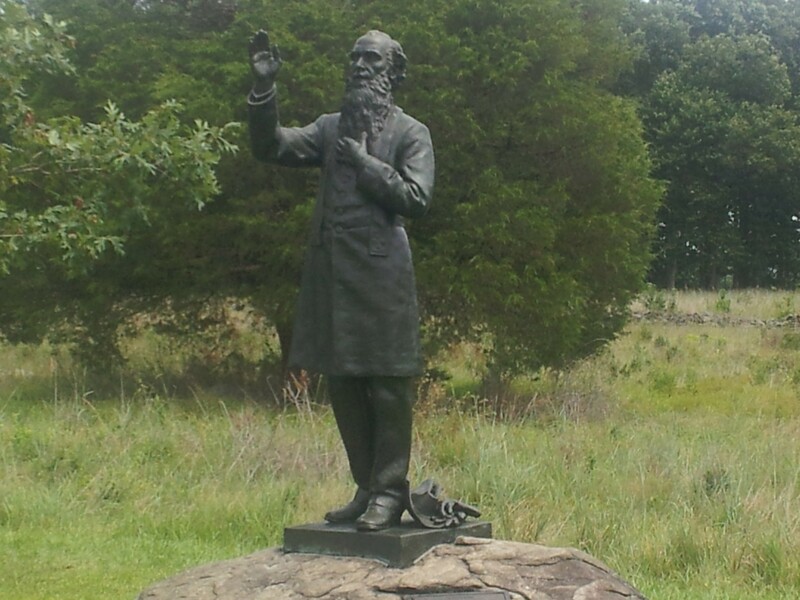 My final repost of an article written while living in Gettysburg last year. 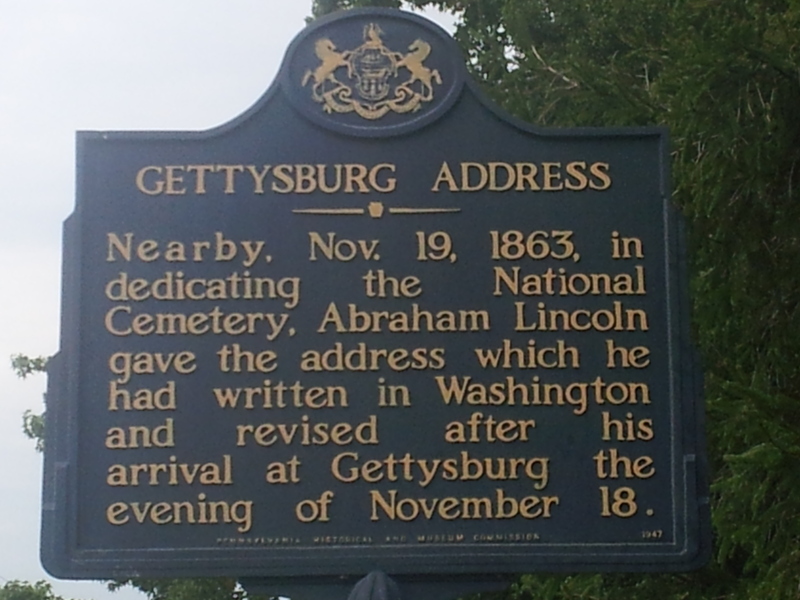 Our campsite is approximately 2.5 miles from the very site of Abraham Lincoln’s Gettysburg Address. I have visited the Soldier National Cemetery on numerous occasions. Here are some of my observations. There are some who have suggested that Abraham Lincoln could have been remembered for his literary prowess in the same category as a Mark Twain had he chosen to be a writer rather than the great emancipator President that he became. Walking around the Gettysburg battlefield I have had to question if this place would have been so revered had it not been for the 272 word speech Lincoln gave to dedicate the cemetery. I just can’t get enough of that speech. As I have listened to many of the speeches during the Republican National Convention and will hear more in the weeks to come during this election season, I marvel even more at the impact this two-minute speech made in our history. It seems to me that speakers today could learn some lessons from Lincoln if for no other reason than for it’s brevity. Long winded sermons and speeches tend to frustrate me more than inspire. My ability to stay with someone longer than fifteen minutes is my own fault – though I doubt I have attention deficit disorder. My problem is subject deficit disorder. If you can’t get your point across in under fifteen minutes – times up! At church when I see the outline has more than four points – it’s going to be a struggle for me. I want to scream to every student, pastor, and teacher who stands before an audience – arguably the greatest speech ever made took TWO MINUTES. Perhaps nothing (in my mind) was more relevant in Lincoln’s speech than the idea of “new birth of freedom”. As the nation was coming apart at the seams, Lincoln realized the pain and carnage of the war could result in either perishing from the earth a government by the people or it would result in an even greater, stronger union. He may have been the only one that day in November 1863 to understand the bigger picture of the war. And it may have been lost on most what he meant by “new birth”. Let me try to explain how I understand that. Lisa and I have had a wonderful marriage. It started out with all the pomp and circumstance of a grand wedding and moved through that first year with only a few rough patches. But over time we began to have some disagreements. She may have wanted one thing – I may have wanted another. Some of those disagreements turned into full-blown fights – all of which we finally worked through. But our marriage would take a drastic turn in 1986. In January of that year she gave birth to our oldest child, Justin. Her labor through the night was unbearable and after about twelve hours the doctors finally decided to do a C-section. At 7:28 the following morning – Justin was born. The long struggle through the previous night had bonded us together as a couple like never before. Together we held our child for the first time with a renewed committment to each other and our marriage. Justin would be joined by a daughter, Heather, two years later and our bond became that much stronger. Lisa and I have a strong marriage because we have withstood many, many challenges. Similar challenges have doomed many marriages into divorce and we are enjoying the benefit of a loving marriage that has now lasted almost thirty years. 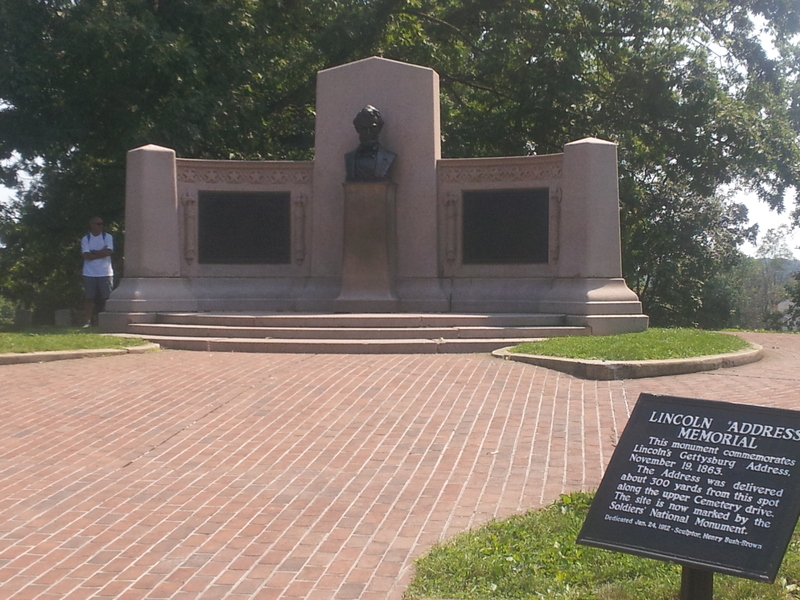 Perhaps now you can understand why I marvel at Abraham Lincoln’s Gettysburg Address. He understood the struggle of exercising freedom and was able to capture the hope of a brighter future when that awful war would be done and a real ‘United’ States could be born. What a brilliant way to understand the “struggle” he spoke of in that speech and Lincoln knew that the great experiment of a government “by the people” would “perish from the earth” if that new birth was not realized. Postscript: I have walked through the Soldiers National Cemetery numerous times and have tried to figure out where Lincoln was standing when the speech was given. The National Soldiers Monument is assumed to be the spot. 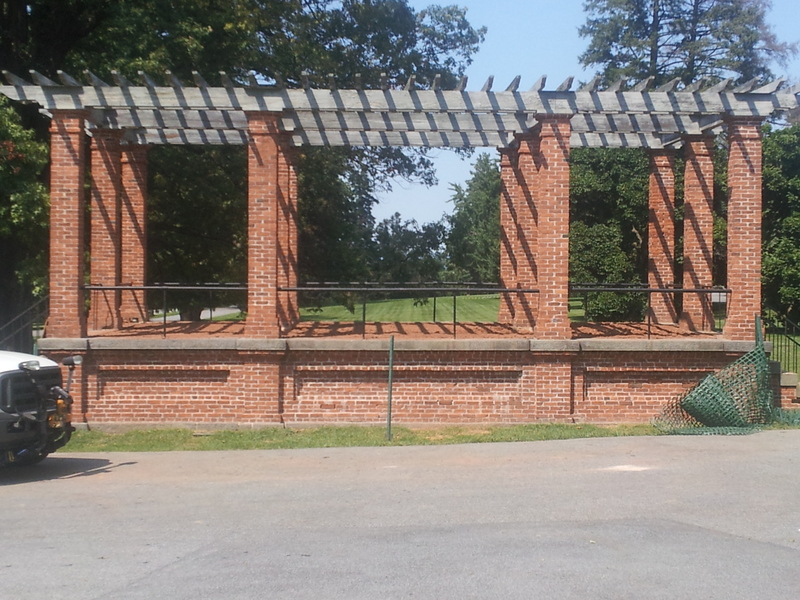 Since the podium was dismantled immediately after the ceremony – there is no recorded history of the exact location. There are several possibilities. For some time I assumed this was the spot. It is not. The problem with that theory is that graves were still being dug when Lincoln gave his speech four months after the battle. So no – even this is not the spot. So where did Lincoln give this speech? I had to find out. Finally a park ranger explained it all to me. There were no photos of Lincoln giving his speech. In fact his speech was so short the photographers did not have time to get set up to take pictures. There is a picture, however, that was taken immediately following his speech and experts have been able to determine the exact location of the podium based on landmarks in the background. So are you ready to see the spot? 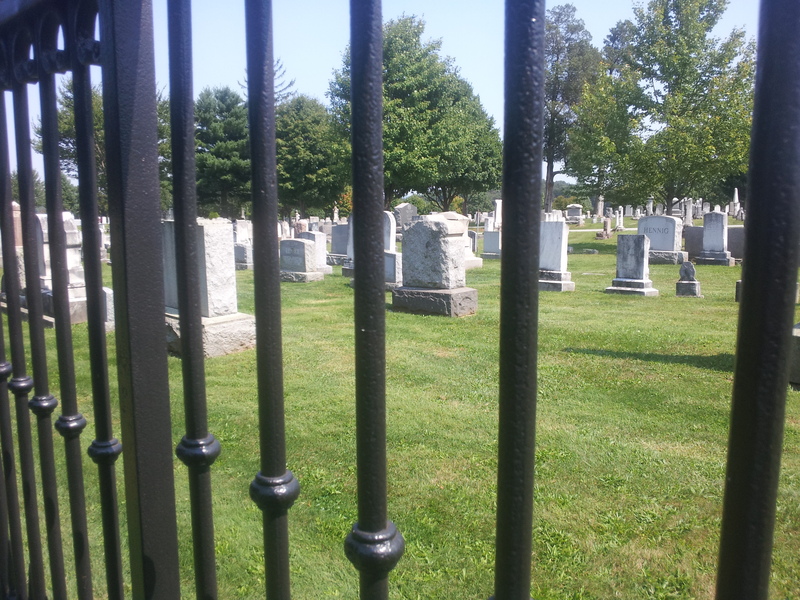 The Soldiers National Cemetery is bordered by the local Gettysburg cemetery called “Evergreen Cemetery”. The fence that separates the two was actually the fence in front of the White House when Lincoln was President. It was moved after the dedication. 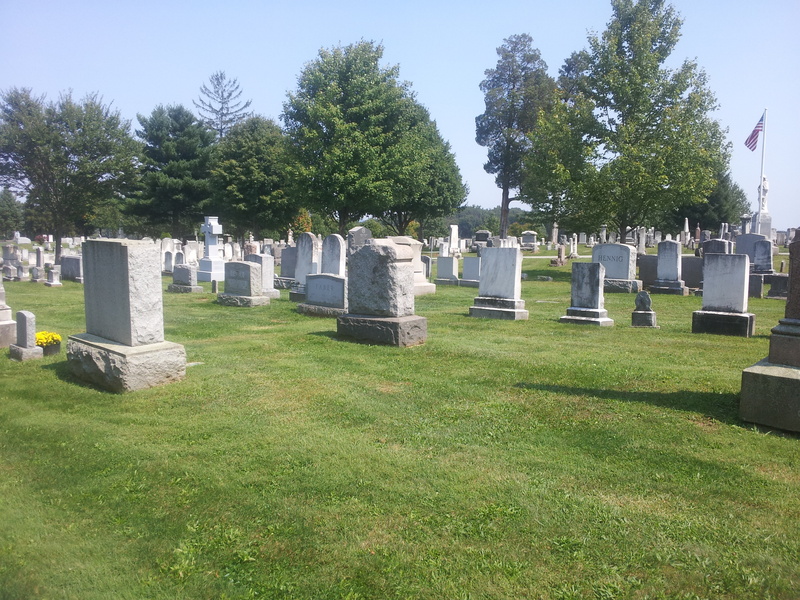 The rough cut gravestone that is in the middle of the picture and is between the second and third bar from the right – is the spot. You can see it without the bars blocking your view below. The exact spot is believed to be where that rough cut head stone is located in the very center of this picture which is actually in the “Evergreen Cemetery” approximately one hundred yards from the Soldiers National Monument. Perhaps parents whose children are now grown and doing life for themselves can relate to this post. Now and then I see a parent and their children in a particular moment that reminds me of many of the moments Lisa and I had with ours. The memories of our younger days as parents fade little by little until we rely on witnessing other parents and children in their moments together and are taken back to that precious past. Looking back I sometimes wish I had written more about those days when they were young – perhaps a daily journal of things they did and said. Too late for that. But before I enter into that all too familiar world of parental guilt – let me say I refuse to look back with regret. Lisa and I raised two marvelous people who make us proud every time we think of them. Without question we did not do everything right. But I have endured too many sermons that drew on men’s natural guilty emotions of not being an adequate father or husband and I’m through with that. As I turn for home in this life God has given me – it’s time to admit things are what they are and God be praised for patching up a lot of mistakes I have made in my life with an abundance of grace and forgiveness. I wish I could tell the dads of this world to just hang in there and accept that none of us are “good” parents – we are flawed through and through and it is in those flaws that God can work his miracle of grace. This may raise some eyebrows but here goes: I am through trying to be a “Godly” husband and father. I am simply not “Godly”. God is “Godly”. I am merely a man in love with God who will never get it together. I will never stop messing up – never be the kind of father or husband I “should” be and so I am through faking it. What I am is a flawed man who God won’t give up on and thank God neither will my wife and two kids. And when grandchildren come along – get ready – I will be a flawed Grandpa. But there lies the good news of the gospel. God loves me – flawed. The gospel has been lived out in my life through my children and wife’s love of me more than anyway I can think of. Jesus is alive through them because they forgive me – I forgive them – because God forgives all of us. I was walking through the campground here the other morning and saw a little family riding their bikes together. There was the dad in the lead followed by what looked like two middle school aged children and bringing up the rear came the youngest child and at the end of the line came the mother. The youngest child had (it appeared) just learned to ride his bike without training wheels and was wobbling his way along at his mom’s encouragement. They all began to descend a fairly steep hill and I watched as the little one continued to pick up speed until I thought for sure he was going to crash and burn at the bottom of the hill. In the meantime I noticed that the parents said nothing – just allowed whatever was going to happen – happen. It crossed my mind that the parents were being a bit negligent. How could they let this little boy go down this hill? He was not ready. He could get hurt. They should be more careful. I could almost not bear to watch. His little legs could no longer keep up with the spinning pedals and he straightened his legs out as he flew down toward his dad and siblings. His momentum carried him into a grassy area and amazingly he managed to go around all of them and take the lead at the curve at the bottom of the hill. I laughed out loud. I thought if that would have been me I probably would have been screaming at the top of my lungs and probably mad when I finally got to him. Here the moment passed without incident as the parents let happen what was going to happen. Which in the end turned out being nothing. Experts may look at this as parental neglect. Some may say the parents and child simply lucked out in avoiding serious injury or consequences. Others would go as far as to say they are not fit to be parents. The truth is – none of us are. I don’t know what the lesson in all this is – maybe there is not one. But I do try to control things that are out of my control. I do too much worrying about things that I can’t change or manage. Life sometimes sends us and our children flying out of control down a hill and all we really can do is pray and hang on. And when we take the lead and escape injury at the bottom of the hill – I think we should celebrate! Lisa and I realized as I was taking her to work this morning – that we are now just one month away from finishing this assignment here in Gettysburg. We have no idea where we will be a month from now. It is exciting and a little stressful not knowing yet where we will go – but “grace has brought us safe thus far – and grace will lead us home”. One things for certain – we will be sad to leave here. 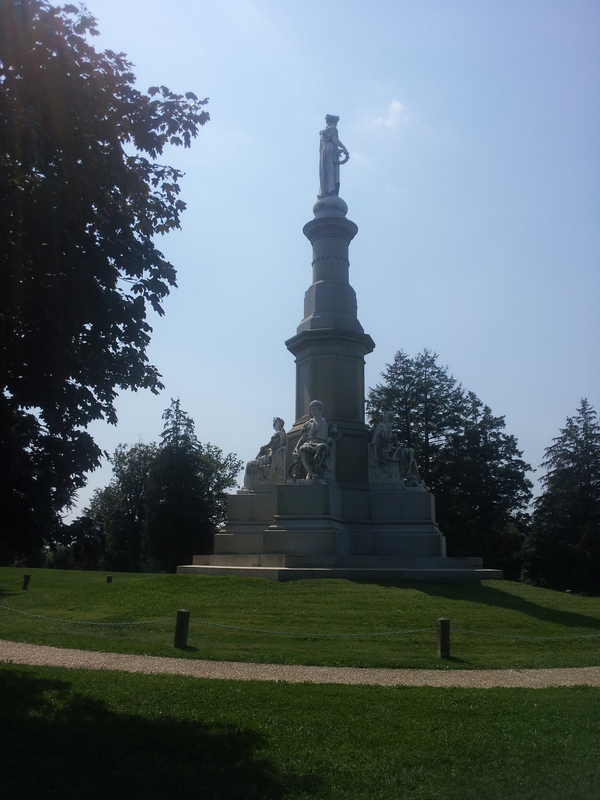 The people have been tremendous and I simply cannot get enough of the battlefield and the civil war history in the area. I walk the battlefield every day and discover something new each time. 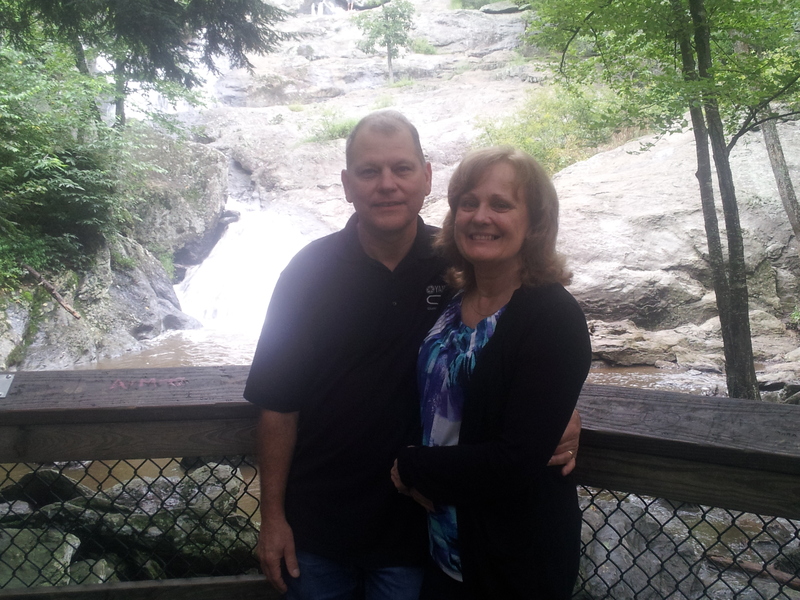 We were so glad to have Wes and Kim Page visit us this past weekend. We did the Gettysburg segway tour along with a trip to Strasburg and our little train ride through Amish country. They accompanied us to our Nazarene church in Hanover on Sunday and did a little hiking at Cunningham Falls (see photo below). We felt a little like Uncle Albert in “Mary Poppins” when Wes and Kim left. You remember the scene where Uncle Albert has levitated to the ceiling during one of his laughing jags and then when told it was time for his guests to leave said that was one of the saddest things he had ever heard and floated back down. It is so good seeing familiar faces but kind of sad when they leave. Friends are so precious to us and even more appreciated when you are away from home. We appreciate more than anything friends who have a genuine interest in your life and actually feel your emotions through good times and bad. Good friends share your joy, sorrow, successes and struggles. Wes and Kim have been those kind of friends to us through the years. Lisa and I can only hope we have been the same to them. It was due to Wes and Kim’s encouragement that Lisa was able to finally get her registry in cardiac sonography allowing us to finally travel. Wes (I swear there is nothing the man cannot do) helped Lisa with physics and has already started “Skype” sessions as she is preparing now for her vascular registry. The list of things those two have done for us through the years is mind blowing. We can never say thanks enough. We continue to look for a truck to move our RV when the time comes and may have to bring one from Owensboro. The prices here are ridiculous. Sorry we will miss the opening of the new riverfront in Owensboro and we look forward to seeing that when we come home. We have also missed friday night football, our family, our friends and our dogs, Izzy, Bear, and Agnes. This coming weekend our family will be heading up here and we are excited to show them around Gettysburg and Washington DC. Talkin About the Car Wash – Yeah! Trying to get our Trailblazer ready to trade in so we can get a truck to haul this RV when we get ready to leave. Today I decided to clean it up and found one of those do it yourself places with the coin operated foam brushes and power hoses. Frantic – I reached for the rinse hose and tried to get as much of the lathered foam off the car as I could but suddenly realized my time was up. I then realized I had no more cash, no more quarters and a black Trailblazer looking like it had driven through a snow storm. What to do? I had no choice but to get in and drive up the road and find an ATM machine and then get some change. Foam was flying off my car as I sped down the highway looking like a dog shaking in a bathtub. I pulled my t-shirt over my head as I ran into the convenient store and could actually hear people laughing as they drove past. (I’m not sure but I think some people were taking pictures) The sun was baking the suds into a thick, congealed goo that I was afraid may take the dirt and the paint off as well. The ATM charged me $2 for the transaction and after driving back to the car wash and completing the job (about thirty minutes later) – I believe I spent about $26 and the car still needed to be washed. Yep – I’m missing me some Sparkle Brite. Lisa and I send our best wishes to OHS and the start of the high school football season. For the first time in twenty years I will be absent from the press booth and running the score clock. I will miss Corky Teasley and Mike Hayes tonight – sorry to have broken up the team. We will miss the familiar sights and sounds of friday night football. I am including a photo of William Corby who was a priest and army chaplain attached to the Irish Brigade during the Civil War. 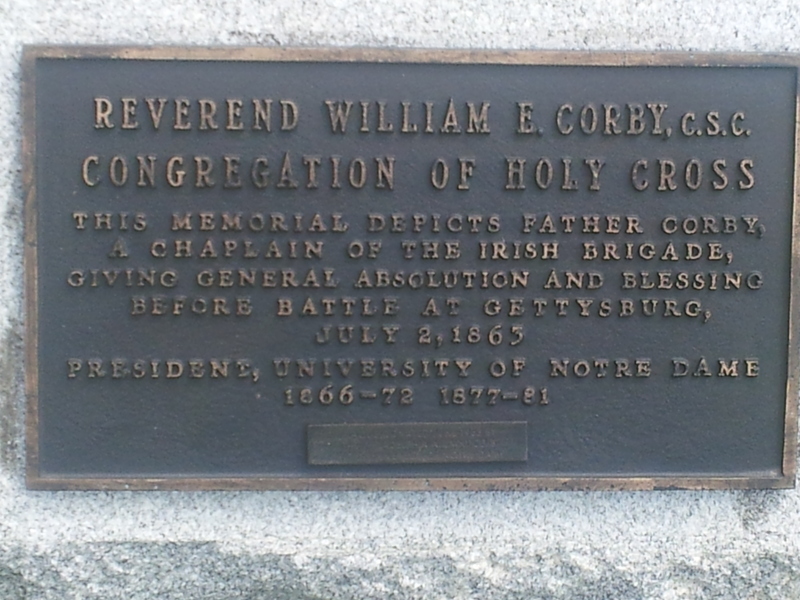 He later became President of Notre Dame and this statue located here in Gettysburg is replicated on the Notre Dame campus where students refer to him as “Fair Catch Corby”. I send an Irish blessing from one of the most famous chaplains in history to the boys in red and black. Go Devils! 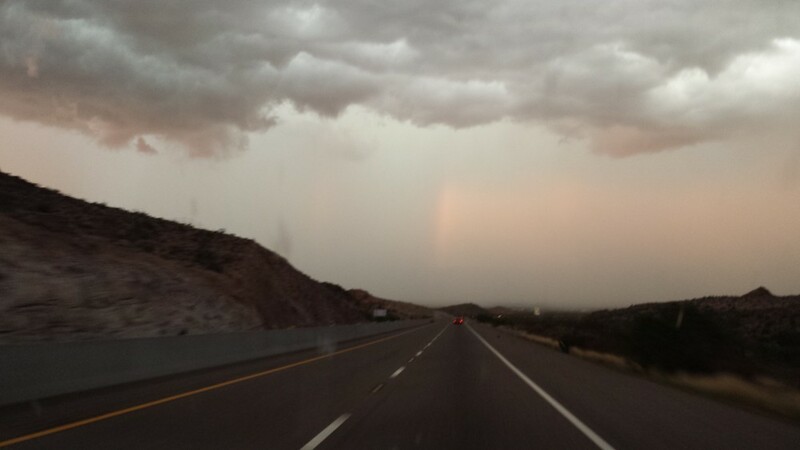 Being away from home for an extended period of time carries a certain amount of risks. We have just kept our fingers crossed that there would be no major mechanical failures of our vehicle or RV. Our 2002 Chevy Trailblazer has just done great up until the last couple of weeks. First our CD player quit working and is holding about five CDs hostage until we get it fixed. Then our back window regulator went out causing our window to slip down and, of course, allowing all the rain we have had here to soak our back seat. Next our right turn signal went bad and now it looks like our air conditioning may be on the verge of calling it a career. Can’t complain too much – the old girl is nearing a hundred and fifty thousand miles and it is only a matter of time before the entire thing bites the dust. In the meantime we are holding things together with electrical tape and prayer. We have even had to deal with some air conditioner problems back home at some rental property we have that our wonderful family has been able to help us out with while we are away. It seems that these mechanical problems are all coming at once – sound familiar? I have very limited mechanical abilities but I do have plenty of time. That has allowed me to surf the internet for answers on how to fix some of the problems we have had and first I decided to try to tackle our car’s back window. I found a salvage yard near York and managed to remove the needed window regulator. It was gratifying for me to get the part I needed and pay about a tenth of the cost I would have for a new one. I thought I may be able to install it myself but soon found the risk was too great for possibly breaking the glass. If things don’t exactly fit I tend to “force” them and “forcing” car glass is probably not recommended – so today it goes to the auto glass shop. I know my limitations. In the meantime Lisa and I noticed our air not getting cold and we kind of looked at each other with that dreamy – this is going to be expensive look in our eyes. At this point any unusual sound, bump, squeak or shimmy causes us shortness of breath and heart palpitations. We know the end is near – we just don’t know how near. Being away from home comes with it expected adjustments such as figuring out how to get from point “a” to point “b” and getting to know people in this strange northern part of the country. Then there are the unexpected disadvantages of being away from home. At home I know the good mechanics and the bad – the honest car dealers and the hucksters – the trustworthy plumbers from the – you get the idea. Here we have no history with the businesses with whom we may need to give advice, fix or possibly trade our vehicle. We will just have to hope for the best. Lisa and I have discovered that there is no greater blessing than finding good, trustworthy people who offer help when we need it. That discovery is always good but even more so when you are far from home. And it is the little things that mean so much. I had to borrow tools from a man at the salvage yard to take the car door apart which I spoke about earlier. I was never so grateful for a socket wrench in my life. God has a way of putting the right people in our path when we have the greatest need. And time and again those people have shown us kindness and offered help that we have relied on. I doubt if they know how blessed we have been by their goodwill. I remember hearing a story about a man in Owensboro who would have donuts each week for the garbage men who picked up his trash. I actually did that for a while and one day got a hand written thank you from them. I’m not sure why I stopped doing that – I know it got a little expensive. But, I know those workers were disappointed when my donuts stopped showing up. People like being thanked for doing things – especially with donuts. When our time is up here in Pennsylvania – I think we will make a list of all the people who have done those “little things” to help us out along the way – and find some way of saying thanks to all of them. After this experience we hope to never take those “little things” people do for us for granted again. Now all we need are some “Rolling Pin” donuts. In honor of the 150th anniversary of the Civil War battle at Gettysburg Pa., I am reposting another article written last year when Lisa and lived there. Thanks! 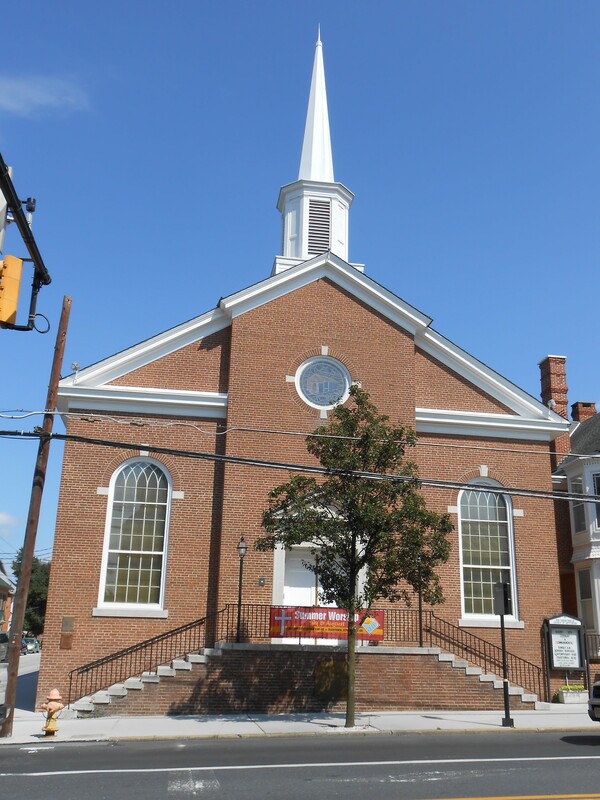 Lisa and I attended the Gettysburg Presbyterian Church this morning for their traditional worship service. 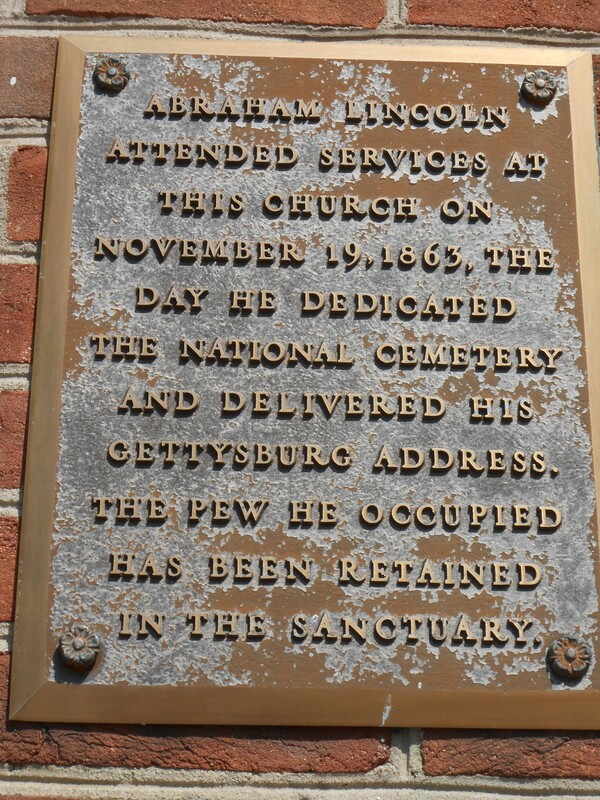 The church has a beautiful, traditional style sanctuary that is famous for having Abraham Lincoln attend the same day he made his famous address to dedicate the National Cemetery. The pew where he sat is marked with a bronze plaque that has become a favorite photo spot of many tourists. I confess (which we did a lot of during the service by the way) that I did not get to see the actual pew where Lincoln sat – but I did see a pew with a plaque commemorating a visit by President Richard Nixon in 1972. But it did not seem to be as famous for some reason. Funny but true – I was looking around for the Lincoln pew when ol Abe himself walked up and welcomed Lisa and I to his church. I’m not kidding about this – it was Lincoln. Or at least the man must have been one of probably several Lincoln impersonators in the area. But it was kind of startling when he walked up. I almost called him “Mr. President”. The service was very ‘high church’ with liturgy and organ music. The choir sang from the balcony behind us and it was tempting (but apparently inappropriate) to turn around and see who was doing the solo. But I kept my head facing to the front and sat and just wondered how this tradition ever started and (even more) how it has survived. Very strange. There were different points during the service that Lisa and I were caught off guard with the singing, standing, and responsive readings. At one point I saw out of the corner of my eye a man next to me grab the back of the pew in front of him. At first I thought he was having trouble breathing but then everyone stood and I realized he knew what was coming – Lisa and I did not. Someone needs to expand seeker sensitivity concepts to believer sensitivity. Even people like Lisa and I who have been in church all our lives were confused at times. Despite all that – Lisa and I enjoyed the service and we both really liked the way natural sunlight brightened up the sanctuary allowing the sunshine through the large side windows. The message was about the ten commandments and the old testament covenant. It was part one of a two-part message. The sermon ended with the promise made by the children of Israel to be obedient. We will have to wait until next week to read the conclusion. Spoiler alert: They were not! I actually enjoy some of the liturgy that was recited. To remind one another of what we believe is not a bad thing. There seems to be a general acceptance of a lot of bad theology in the church today – almost anything goes as long as it is evangelical in its tone. I like being reminded of our core beliefs. I am amazed at how God can work through so many styles of worship. We have now worshipped with Nazarenes and Presbyterians and have concluded that both really love the Lord and Southern Baptists don’t necessarily have it wrong or right in regard to theology or worship style. Loving Jesus comes in all shapes and sizes.